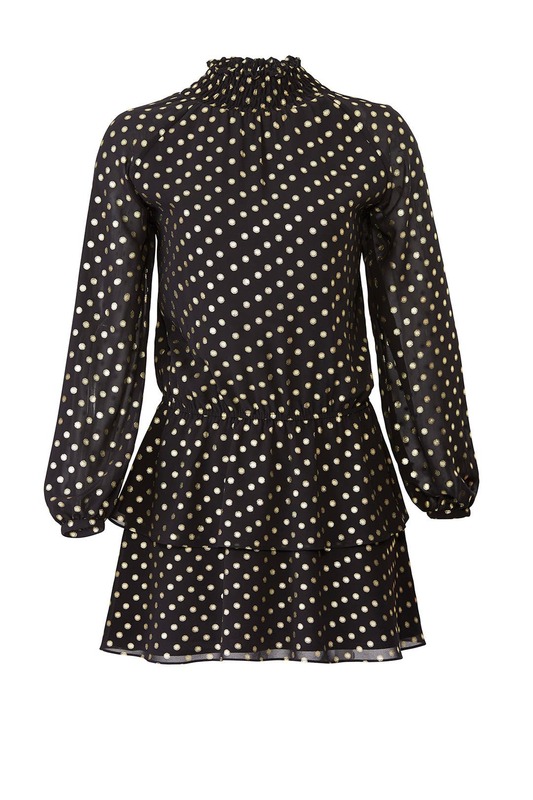 Playful polka dots give this Yumi Kim dress an enchanting look. Style with the Reach For the Stars Earrings by Erickson Beamon. 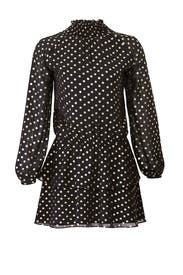 Black and gold printed crepe (100% Polyester). Blouson. Long sleeves. Mock neckline. Back keyhole with button closure. Elastic waistband. 34" from shoulder to hemline. Imported. Full coverage. Highlights your waist with the A-line skirt. Good winter look. Maybe a little too top-heavy for bigger chests. This didn't work well on my 5' frame - just not complimentary. Didn't wear it. I'm 5'11" and this dress was so comfy and easy to wear. 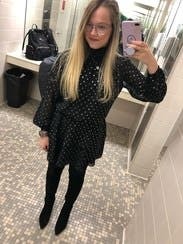 Received tons of compliments!! Cute dress but I did not wear it. The neck is too high for someone with a shorter neck. Made me look like I had a double chin. Material and print is super cute though. Overall I loved the style of this dress. The General fit is good. It's would be a little short on someone taller though. The downside is the high neck. It buttons in the back. I only buttoned one of 4 buttons because I felt like I was suffocating because it was so tight. Wore this out on a girls trip and it's so fun! A little short because of the ruffle and I'm taller so I wore little booty shorts under but I loved it!! 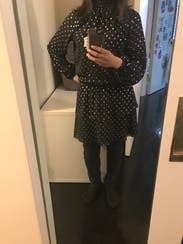 Short on the model but work appropriate for me at 5'2"! Loose fitting. The only part that is a little tight is the neck. I wore it with tights, but probably wouldn't again because the dress is already pretty conservative. Its short, so I wore tights with it. 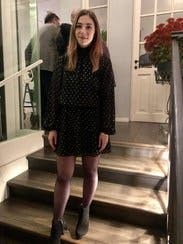 It was a cute look for Thanksgiving. The dots are metallic gold, so very festive. Perfect length. Perfect sleeves. So slimming. I can’t say enough awesome things! I got so many compliments on this dress. The polka dots are mostly silver with a slight gold-ish tint so it literally goes with any color bag or shoe or jewelry you want. Enjoy! Loved it! 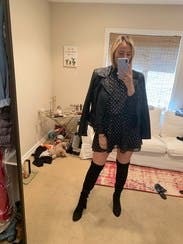 I paired it with a fur coat and black booties; super cute and my boyfriend thought so too! Fits well but was a bit tight around the neck, but got used to it. 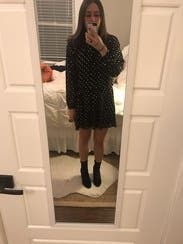 Very good quality dress and perfect for a holiday party! Fit so well. I worried about the drop waist, but it didn't sit very low and wasn't as pronounced as those waistlines can be. I loved it. I love this trendy dress by Yumi Kim! Running true to size with some stretch at the waist, I recommend wearing your true size for your primary size and going up for your back up. This style is fitted throughout the midsection with elastic and loose at the hips. It works for all cup sizes. You are able to wear a standard bra with this dress. At 5’4”, the length hit mid-thigh on me I would certainly recommend curvier women wear some stylish black shorts underneath! 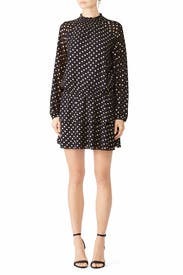 The dotted pattern on the dress is amazing in person and the flowy sleeves make it unique. Pair with black heels and fun earrings to complete your outfit! This was really a unique little dress. The dots are gold foil, not white, so it feels dressier than it looks in the pic. I wore with tights and suede booties and denim jacket, but you could easily wear to a formal event. Very fun and flirty, and a little avant garde as well. My hubby thought it was too adventurous. LOL. So you know it's more fashion-forward when a guy doesn't quite understand. The dress gave perfect cinching in the waist. short, but not inappropriate short. Wore bare legged with black round toe Tory Burch Platform pumps. Great fit! I usually love yumi kim, but this dress was boxy around the top which made it unflattering, and I didn't like the neck. The bottom part fit nicely, but it wasn't nice enough to wear, so I just sent it back. 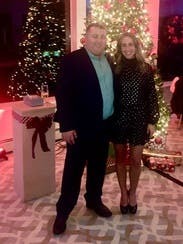 I wore this dress to my best friend's 40th birthday party - got tons of compliments! It is short, so I wore opaque black tights under it.